Strong “Retailer” Presence: We counted over 200 “retailers” (represented by over 800 registrants – 20% of the total registration!) on the registration list and our team met with most of them. Retailers is in quotes because just about all of these “users” are not truly “retailers”, but instead “users” of retail space ie restaurants, fitness, services, entertainment, health care and others. Many of the “users” chose not to exhibit and I believe there are two main reasons. First, many are represented by brokers and those brokers provide a place for them to meet. Second, and more importantly, most users are much more targeted in their site selection. They know where they want to be located and focus on finding that spot on the map instead of being bombarded by submittals for locations that aren’t a good fit for their concept. These users were clearly looking to make deals and procure sites, but on a more selective basis. Embracing Hispanic Communities: We had conversations with developers, cities, and tenants in which they viewed that the key to a particular project was a focus on attracting the Hispanic demographic. Over the past 20 years, I have observed many existing projects that have become oriented to the Hispanic community. But there seemed to be an even greater focus on developing new ground-up projects targeting the Hispanic customer. Technology – The Good, The Bad & The Ugly: I personally had a number of conversations that revolved around technology, including the use of tech to improve site selection, track customers, run our various businesses, and improve the retail experience. There is little doubt that we are all fighting to keep up to speed with the technology that will enhance our respective businesses, while also trying to keep some semblance of sanity in our lives. Although most of what I heard was positive, I was definitely a bit creeped out by the story one person told me about going into an Amazon book store, picking up a book, NOT buying it, and then getting offers for this book on his cell phone the next day. Big Brother is watching. Cautious Optimism – Ahhh, yes the good old economy. Across the board, attendees were appreciative of the strong economy. BUT everyone was also waiting for an “economic spirit” to descend from the rafters to tell them what will happen over the next few years. Increases in interest rates, lease rates, triple net charges, hourly wages, gas prices, and construction costs certainly raise vulnerability, but they don’t have to cause a downturn. As a matter of fact it is possible that all of these factors will temper economic enthusiasm and allow moderate growth to continue. Congratulations to ICSC – We would be remiss if we didn’t mention what a great job ICSC did on the show including a smooth registration process, plenty of seating throughout the venue for deal making, adding food trucks as an alternative to box lunches, great signage for the retailer runway and an excellent cocktail reception Tuesday afternoon. Our only recommendation is that the deal making event start at noon on Monday, go all day Tuesday and then skip Wednesday. Congrats to the ICSC staff and equally important all the hard working volunteers that put together a great event. 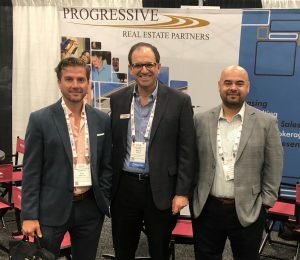 Overall, the ICSC Western Conference was a big success for our team and it was great to connect with so many of our CRE friends “in person” and especially in a day and age when so much of the interaction is via technology.